According to the Federal Energy Management Program (FEMP), the total real energy cost for the U.S. federal government to operate its facilities, vehicles, and equipment in fiscal year (FY) 2016 fell to $16.1 billion, the lowest level since FY 2004. Total site-delivered energy consumption by the U.S. federal government fell slightly in FY 2016 to 0.92 quadrillion British thermal units (Btu), the lowest on record since data collection began in FY 1975. The main contributor to lower total energy costs is the sharp decline in per-unit energy costs. In FY 2016, real per-unit energy costs were $17.56 per million Btu, down 23% from the prior year and at their lowest level since FY 2007. Note: Site-delivered energy consumption is divided into facilities, vehicles, and equipment energy usage. Petroleum accounted for 63% of the U.S. government’s total energy consumption in FY 2016, and it has generally remained between 63% and 69% for more than two decades. As a result, low crude oil prices over the past three years were a significant contributor to lower energy costs for the U.S. federal government. Jet fuel was the most consumed fuel, accounting for 44% of total U.S. government energy use in FY 2016. The U.S. Department of Defense (DoD) is the primary U.S. government consumer of jet fuel, while the U.S. Department of Homeland Security is the main civilian agency using jet fuel. Overall, the DoD accounted for 77% of total site-delivered energy use in the U.S. federal government in FY 2016, which was a slight decrease from the previous year and is the lowest percentage for that agency on record. 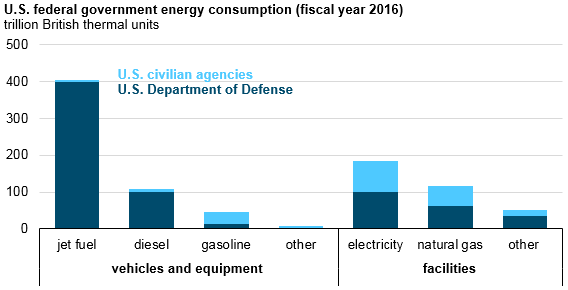 With one main exception, the DoD is the primary consumer of most energy types used by the U.S. federal government. The exception is the U.S. Postal Service’s consumption of gasoline, as the postal service accounted for 40% of the government’s total gasoline consumption in FY 2016. Since FY 2014, when crude oil prices began declining, total U.S. government vehicle and equipment energy costs have declined by about 40%. Energy costs for petroleum fuels such as jet fuel, gasoline, and diesel also decreased by about 40%. Government facilities’ energy costs declined 17% since FY 2014. The cost of electricity, the most-consumed energy type in facilities, declined by 8%, and the cost of natural gas declined by 30%. Because crude oil prices in FY 2017 averaged $9 per barrel more, or about 21% higher, than in FY 2016 and with estimates of DoD operational energy consumption in FY 2017 slightly higher than in FY 2016, EIA expects total energy costs for the U.S. federal government to increase in FY 2017.